This image was captured over three nights on October 15, 16, and 17, 2013 from my home observatory. This picture consists of 19×1200 seconds with the SII filter, 22×1200 seconds with the Ha filter, and 16×1200 seconds with the OIII filter for a total of 19 hours. 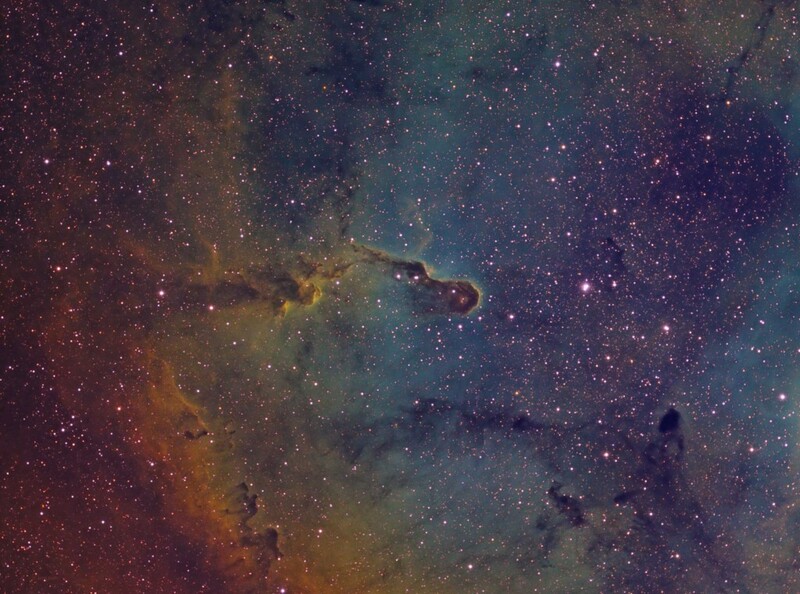 The Elephant Trunk nebula, also known as IC 1396 is found in the constellation of Cepheus and is about 2,400 light years away. IC 1396 is one of the largest emission nebula taking up about 3 degrees of sky and contains several star forming regions. The most prominent is IC 1396A which is the part that resembles an elephant trunk. IC 1396A is a dense, dark cloud of dust that is edge illuminated by a very bright nearby star that also illuminates the entire nebula. The bright star is HD 206267 and is a massive Type O. The radiation and winds from this star are thought to be the force behind the compression of gas and dust creating the star forming regions. In the tip of the Elephant Nebula is a circular globule of dust that is open in the middle. Two stars are found here and they are newly formed stars that have cleared a section of the dust cloud as a process of their formation. One of the stars is clearly apparent in my image but the other is partially obscured by remaining dust in the area.